A rugby coach who transformed the fortunes of a north-east ladies team by teaching his players to “believe in themselves” has died of cancer at the age of 50. Tim Harris was well known in the region’s rugby community as a player, coach and referee. He was diagnosed with kidney cancer in 2016 and died at his home on Aulton Court in Aberdeen last Sunday. 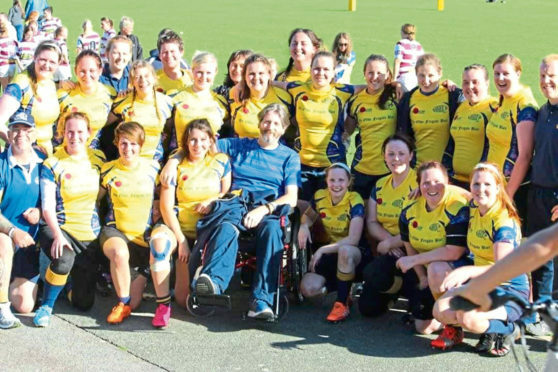 Under his guidance, Garioch Ladies Rugby Club went from rags to riches, and Mr Harris did not let illness prevent him from helping the team to develop. He would watch videos of their games while undergoing cancer treatment and offer sage advice on where the side could improve. And, though he was confined to a wheelchair, Mr Harris made it to the sidelines at Murrayfield to cheer the women on when they reached a cup final. Club captain Jess Silcocks said: “We are deeply saddened. Tim was our beloved coach and friend. “He taught us the spirit of rugby and to believe in ourselves. She added: “Tim saw us through our first competitive season and onwards. “He took a naive young team, toughened us up, and made us what we are. Peterhead Rugby Club secretary, Neil Davidson, described the coach as “one of the real characters in north-east rugby”. Mr Harris was born in America and moved to Scotland with his family when he was 10. He attended Ellon Academy and worked as a pub doorman before becoming a roads worker for Aberdeen City Council in 2012. His funeral will take place at noon on Monday April 29, at St Fittick’s Parish Church in Torry. Mourners have been asked to wear comfy and colourful clothing or rugby shirts. The collection will go to MacMillan Cancer Care.